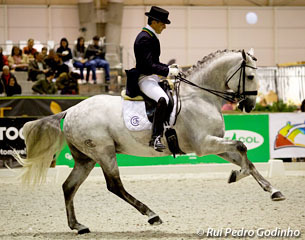 Portugal’s top riders took the Grand Prix arena at the 2016 CDI Lisbon on 29 - 31 January 2016 as they attempt to earn an individual spot at this years' Olympics. Gonçalo Carvalho and the 9-year old Lusitano mare Batuta took out the Grand Prix on 72.060%, Daniel Pinto stepped up in the Kur to score a very tidy 76.490% aboard 10-year old Santurion de Massa, and Miguel Ralão Duarte on new ride 13-year old Xenofonte d' Atela claimed victory in the Special on 70.580%. The panel of judges for Lisbon included 5* judges Riexinger (GER), Holler (GER), and Matthiesen (DEN), assisted by Spanish judge Maria Santos and Portuguese judge Carlos Lopes. The latter certainly showed some nationalism in his scoring as he was a whopping 5% higher than his four colleagues on the top two ranked riders in the Grand Prix, Gonçalo Carvalho as well as Daniel Pinto. Gonçalo explained that while Batuta (by Quixote x Icaro) was a little bit more nervous in the test, it was normal as the conditions in Lisbon were difficult. He only rode the mare in the Grand Prix class and opted not to show her in the Special or Kur. Right now the pair are concentrating on claiming a spot at Rio and will compete at three more shows before the end of March. Hitting their record score in a Grand Prix Kur, Daniel Pinto and the Trakehner x Lusitano cross bred Santurion de Massa (by Munchhausen) were very happy with their 76.490%. Daniel says that watching the test he can see that the horse is really in top form. Daniel added that the trip to the CDI-W London was very worthwhile, as it exposed the horse to many new and exciting elements of competition, and this really helps to get the horse more used to that sort of atmosphere. He is now focused on lifting his scores to earn more qualifying points for Rio. However Daniel admitted that the Olympics are not his main goal. “It would be fantastic to have two Portuguese riders enter in Rio, but my true aim is to continuing improving and growing with this amazing horse. I have been riding him since he was three. We have come a long way together. My goal is to keep him healthy and continue achieving great results together with the help of my trainer Kyra Kyrkland." Off to Nice next month and onto Belgium after that, Daniel knows that they can reach even greater heights. He hopes that with each competition he can lift those percentages up. “The horse still has a lot left in him and we still have many big competitions ahead of us; the Europeans, the World Cup, and even the Tokyo Olympics," Pinto explained. Miguel Ralao took out the Grand Prix Special on 70.580% with Xenofonte d'Atela, a horse he was given the ride on in June last year. Miguel is really happy to have already broken through the 70%. Adding that the horse is super in shows, Miguel says Xenofonte (by Hostil) has a very brave character. You know that when you arrive at a big competition he will be with you from the beginning. “It’s a nice feeling, to have confidence in your horse and to know that if you travel a long way he will give you his best at the competition," said Ralao. While the partnership is still a "work in progress", Miguel hopes to increase the frequency of his outings, and gradually increase their performance and percentages.